IE Blog Europe & CIS | From Amsterdam: Trends and Careers in Big Pharma (and Making the Jump from a Consulting Background). From Amsterdam: Trends and Careers in Big Pharma (and Making the Jump from a Consulting Background). Once per year the Europe and Central Asia team from IE’s International Development team gathers for a leadership meeting, and as tends to happen, we also like to host an Alumni Appreciation Night around this annual gathering. 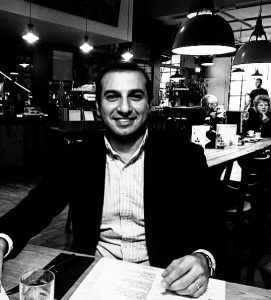 This year, as senior leaders from the team met in Amsterdam at the Room Mate Aitana Hotel (the Room Mate Group is Spanish scale-up success story in itself), we also had the chance to catch up with Karan Ambwani (IMBA ’08) for a quick interview. While today he’s the Director of Strategy and Alliances at TEVA Pharmaceuticals Europe, his career has included stints at Novartis, CapGemini, IBM, and he even headed up the Innovation area at IE for a couple of years, after graduation. Below is the transcript from an interview with Karan (KA) and Regional Director for Europe and Central Asia, Joël McConnell (JM). KA: “As a general management consultant, with both, IBM and Capgemini, I was exposed to a wide range of projects across industries and functions – from MRO services for military aircraft to a new food category development for FMCGs. Being a part of a consulting organization focused not only on board level recommendations but also on providing support in execution across functions and industries helped me acquire a wide skill set. Among others – being adept at structured problem solving, ability to lead senior level professionals to resolve complex challenges and a functional expertise in Marketing, Finance, IT and Operations. KA: “I believe the most important thing that is happening in the pharmaceuticals sector is a fundamental change to the business model. The business model of the pharmaceutical industry has not yet been disrupted by the advances in technologies to the extent of similar disruptions in most other industries. Currently, the average cost to develop and market a drug is about US$2,5 billion. Most of this cost is borne due to the higher failure rates across an intensive research, development & approval process that requires significant time investment of about 10 year per approved drug. Till now, a higher price justified this risk undertaken by pharmaceutical companies but recently price gouging practices by a small sub-set of the industry and a consolidation of other players in the health care value change resulting in a decreased rebate pass-through has led to a disproportional increase in the prices. In the near future, as these drugs become more complex e.g. biologics, and individualized to a patient’s genetic content, these research, development and approval costs would continue to increase unless offset by significant advances in technology. I believe not only is the current pharmaceutical business model is not sustainable but wider healthcare model is now closer to a tipping point and in turn healthcare delivery requires a systemic disruption aided by technology. Pharmaceutical companies will need to leverage technology in all aspects to reduce drug prices – from reducing the drug development costs through predictive analytics, reducing clinic trial costs through leveraging electronic health records for patient selection, wearable devices to track trial adherence to ensuring lower healthcare costs by better management of chronic diseases through various digital aids and devices. In addition, to effectively reduce health care costs we will have to focus beyond price decrease of drugs and focus on overhauling the entire healthcare delivery value chain through changes in regulations, increasing the efficiency of the approval process, ensuring competiveness amongst various players. KA: “While a health science background definitely helps a lack of it does not necessarily impede your progress in a big pharmaceutical company. A pharmaceutical company’s purpose is improve the quality of life for patients but to be able to do so requires a coordinated effort from various functions within the company. A health sciences background can perhaps help in a faster understanding of the problem and the solution (e.g. drugs mechanism of action) but it might not be an advantage while ensuring the delivery of the drug to the patient at the right cost, time and quality. A coordinated effort across functions such as manufacturing – aiming and reducing the manufacturing cost, market access – aiming as ensuring reimbursement and accessible pricing, sales force – educating physicians on the drug impact of quality of life are fundamental to meeting the purpose of a pharmaceutical company. I believe my skills set helps me to ensure this coordination and alignment among people and resources to help us, as a pharmaceutical company, serve our purpose in an economically viable manner. Dimitrios Spiliopoulos: Leading Engagement Actions on Campus, Making the Elusive Triple Jump at Graduation, and Becoming an IoT Expert.Tokyo to Tel Aviv (via Madrid): IE Master of Visual and Digital Media Alumni On Exhibit at Bauhaus Center in Israel.